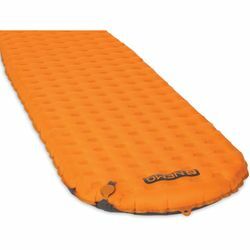 NEMO Tensor Alpine Ultralight Mountaineering Sleeping Pad. This pinnacle mountaineering pad offers lightweight, compact, extreme warmth without sacrificing comfort. Three layers of suspended metalized film and a unique construction efficiently retains your own body heat. Tensor™ Alpine brings warmth and comfort to cold weather camping. Whether at base camp or high on the mountain before a summit push, the combination of compact size, light weight, and warmth cannot be beat. A zero-profile, multi-functional, micro-adjustable valve offers convenient inflation and fast deflation. The included Vortex™ pump sack provides fast and easy inflation without introducing moisture into your pad. Patent-pending Spaceframe Baffles™ are low-stretch trusses that provide greater stability and point deflection resistance than competitors. Tensor™ Alpine's unique construction sleeps quieter than other pads. Three layers of suspended Thermal Mirror™ metalized film provides quiet insulation with an unprecedented weight-to-warmth ratio.